Last week I officially started my program to become a certified Holistic Health Coach with the Institute for Integrative Nutrition. As part of our program, we needed to set our intentions for the next year, describe our vision and descriptive words of how we see ourself in that vision. I typically find myself to be more productive when I put my intentions out into the Universe, so I thought I would share those on my blog. In March of 2011, after working in landscaping and gardening for 11 years, I got the urge/calling/message to start a blog. While trying to figure out a blog name that resonated with what I was doing at the time. I also wanted to find one that resonated with who I am and what I want to be doing in the future. I finally settled on Walnuts n Pears, stemming from a 17th century English proverb, “Walnuts and pears you plant for your heirs.” This proverb spoke to me because it encourages us to be mindful of how we live and be conscious of what we are leaving for future generations. In other words, it encourages us to live sustainably. The concept for Walnuts n Pears originally started as a vision to open a physical space for people to access information on all things related to living a centered, healthy and fulfilling life. My vision for the physical space will have a kitchen, classroom, yoga/meditation space, art studio, greenhouse and outdoor edible gardens. In March of 2011 phase 1 began when Walnuts n Pears (the blog) was launched. The goal was to have a virtual space to share information on landscaping, gardening, harvesting, cooking, preserving, eating and healthy, mindful living. Phase two and my intention: I am building a successful business helping myself and others eat, grow and be well by being an inspiring holistic health, wellness and gardening coach, offering classes, workshops and seminars in holistic health, wellness and nutrition and as well as sustainable, organic and abundant, edible gardens. I look forward to everything else I will be learning and connecting with all of you in the coming year. If you don’t understand why you should buy or grow organic food, this post is for you. 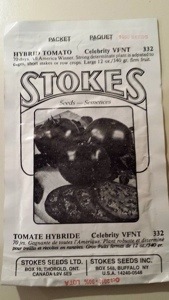 I was sorting through a stash of seeds for the school garden tonight and ran across this packet of tomato seeds. Please read the “fine print” in red on the last photo. These seeds are toxic to those with allergies to chemicals, should not be fed to animals or birds and should not be handled without gloves… but it’s okay to plant them in the soil and eat the fruit that comes from them. Organic standards do not allow these or other chemicals to come in contact with our food at any stage of growing, processing, storage or handling which is one reason to choose organic over conventional food. Typically, in the US, companies are not required to disclose which chemicals they use in their processing on labels. 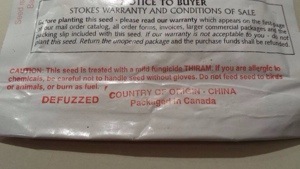 I’m not sure why this was labeled the way it was, I’m guessing it’s because it was from Canada (because this is not the norm in the US), but if you saw this “Caution” on the seed you were about to plant with your children, on the fruit you were about to buy in the store or the bread you were about to buy, would you change your mind? Would you still think the packet of organic seeds that costs 25 cents more, the apples that are 15 cents more or the bread that is 50 cents more is expensive or would your perception of what you are about to purchase change? The only guarantee we have today, that these and other chemicals aren’t in our food, is to buy Certified Organic.